Thousands showed up for the Pink Dot event at Hong Lim Park on Saturday wearing pink. Families of all shapes, colours and sizes came down to Pink Dot to support the values that all families embrace - Unconditional LOVE. Feel free to tag yourselves in this photos! Prime Minister Lee Hsien Loong was invited to attend. But he was out of the country. There is space for the gay community, but they should not push the agenda too hard because if they push the agenda too hard, there will be a very strong pushback. Meanwhile, the Faith Community Baptist Church led by pastor Lawrence Khong urged its members to wear white to its weekend services. I don't know if PM Lee was invited. But on Saturday evening (same time as Pink Dot), he posted on Facebook a picture of him with other Singaporeans in Japan. Look at the shirt he's wearing under the jacket. 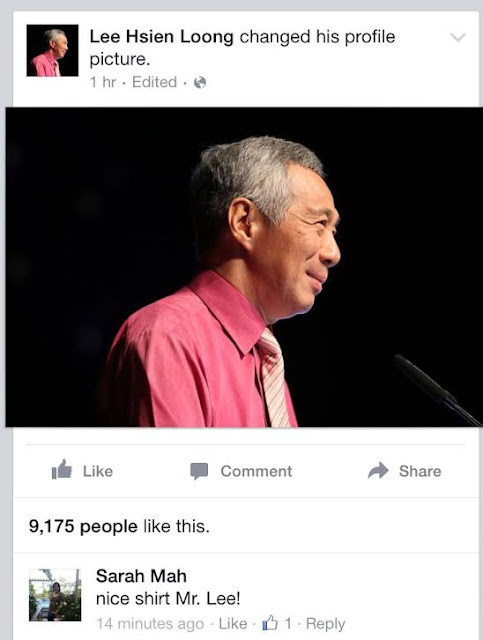 Then last night, PM Lee updated his Facebook profile photo to one of him wearing a pink shirt with a pinkish tie. For a supposed Man In White, he has quite a few pink shirts in the closet.